There is not an eye shadow that this brush does not like. The soft, densely packed hairs pick up any kind of eye shadow beautifully and really allow you to pack on color for a vibrant look. This is also nice for lightly sweeping color over the lids. It is easy to control how much shadow you load on this brush. I have had my 239 for several years and it has held up beautifully. It is one of th...read moree easiest brushes to clean and each time I do, it looks like new all over again. I love that the hairs are white so you can easily see the shadow on the brush. So many eye shadow brushes flop around too much, but this one has the perfect amount of give for working on the base of the lid. The tip is small enough that you can use this to place highlighter on the inner corners of your eyes or run a darker color along your lash line for a smokey look. You can also use this for placing highlighter on the brow bone. If you don't have this brush in your beauty arsenal, you are really missing out! I love this brush because it really packs on the pigment. You can blend several colors together. 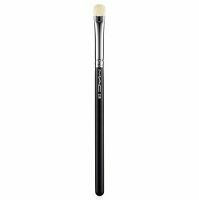 The bristles are dense and the size and shape of the brush allows you to line your lower lid, highlight your browbone and apply eyeshadow on your creases.